What does it mean when we say God can do anything? Is that really true? If God works like that, why is the world so oriented toward processes? In this episode of Swedenborg and Life, Curtis Childs takes viewers through all of the things God can’t do, looking at the laws he used to create the universe, and examining the way God follows his own laws, all through the lens of eighteenth-century philosopher Emanuel Swedenborg. 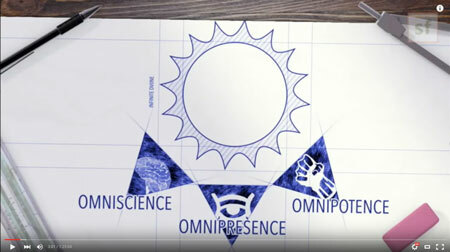 Omnipotence, omnipresence, and omniscience—all powerful, all present, and all knowing, abbreviated in his section as “the omnis.” Swedenborg goes over all the deep nuances of these well-known Christian concepts in his theology. 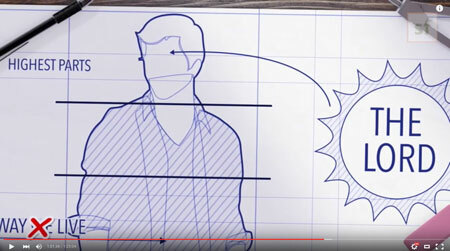 Curtis shows viewers a diagram of these three concepts at 3:00, showing some of the nuances in the meanings. Swedenborg writes that these three ideas about God haven’t really been understood in the past because they are “laws of divine design” (True Christianity #49). Curtis explains that the omnis have to follow the pathway of the laws of divine design and love and wisdom—meaning that God can only be all powerful, all present, and all knowing if and only if those things are working within his own laws of divine love and divine wisdom. Curtis introduces a guest to show how we see physical laws of physics on earth. Dr. Max Blair talks about observing the physical laws that exist in the world through a pendulum. Curtis says that spiritual laws work in a similar way to observable physical laws. These spiritual principles aren’t laws because people have made them laws, but they are preexisting qualities of the universe that people discover. At minute 7:44, Dr. Blair explains the principle of how a pendulum works, and Curtis uses that as a jumping-off point for understanding spiritual laws. This idea brings Curtis to the first spiritual law: Nobody can act contrary to his or her will. God follows this same law, and his will is comprised of love itself and wisdom itself (True Christianity #37). According to True Christianity, this means that God cannot act contrary to his will, either—he must act in love and wisdom at all times. Guest speaker Dr. Jonathan Rose speaks at 15:57 about our ability to choose relates to God’s presence within us. God always reaches out to us, but we choose whether or not we turn toward God. Although God is omnipresent and always able to be perceived, we don’t have to perceive him. Curtis says that this leads to the first “can’t,” of the show at minute 18:40: God can’t force us to accept him. God cannot go against his own love and wisdom and force people to do anything. God wants to be one with us, which is the nature of the divine love of God. At 22:05, Curtis introduces guest speakers who describe experiences of love, showing how easy it is to think of love as just a concept rather than an active feeling. Curtis asks viewers to keep that sense of the feeling of love and hold on to it through the rest of the episode. Curtis reads quotes from True Christianity that show how God makes himself present to all of humankind without forcing anyone to accept his will. Dr. Jonathan Rose gives the analogy of a parents’ house with bedrooms for the adult children to live in to explain the way an infinite God gives finite space to humankind. In this analogy, God is the house, and each individual has a room. The room is “theirs” to do with as they please, even though the house belongs to the parents. Swedenborg writes,“Love is nothing but an effort to form a partnership” (True Christianity #43). A reciprocal partnership with people is an essential piece of God’s will, because he wants to fulfill his love by allowing people to feel it and return it as their own. Any true partnership requires consent—willingness on the part of both parties. Swedenborg says that this is the core of human relationships, as reciprocation allows individuals to love each other fully. At 31:51, an animated sequence illustrates Swedenborg’s idea of reciprocation in partnership, showing the importance of freedom, reason, will and action. People can’t just be extensions of God; it would take away the ability for people to think about and consider different options, different ways of loving. It also would take away an “other” for God to love; if people were extensions of God, when God loved people, he would just be loving himself. In True Christianity, Swedenborg describes selfish love as a love for oneself over anyone else—meaning that people would love themselves above all others. 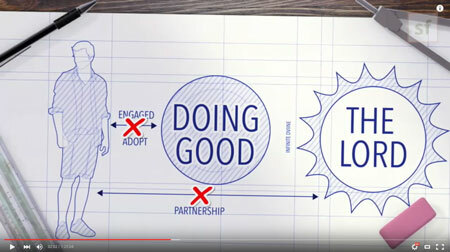 A moving diagram illustrates this idea at 35:34. This idea leads Curtis to introduce another “can’t”: God can’t erase freedom in order to stop evil. According to Swedenborg, God created the world within divine design, the best possible pathway, to create the best possible options for people to be good and loving. However, people can turn away from the pathway and toward evil because they are left in freedom to follow God or turn away from him. Curtis says that God doesn’t have the power to do bad things because it is below him. God cannot do evil; pure love and pure good cannot extend into evil. This means, as Swedenborg says, that God doesn’t throw anyone into hell—he is always giving people as much good as they can handle, sending out his good like sunshine. But people can only come as close as they allow themselves to come. God doesn’t push them backward or forward into or away from the light. He puts the light and warmth out there for everyone—but that doesn’t stop people from creating cold and dark spaces. See a description of God’s power and will starting at 45:01. In True Christianity (#60), Swedenborg writes about God’s awareness of his own design and how he is connected to all parts of it. Swedenborg uses the human body as an example of the awareness of God—just as we are very aware of pain or discomfort in their bodies, God knows when something is wrong with people. At 53:17, professor of biology Dr. Ed Higgins explains the intricate workings of the immune system, which Curtis relates to how we interact within the smaller spiritual ecosystem. It’s possible for people to see where others are having pain as well—guest Chelsea Odhner talks about massage therapy and yoga, focusing on the connectedness in the body at 56:24. This leads to the idea of a design within the human body. People serve as a model and messenger of the way God communicates and makes partnerships with people. People benefit from being part of the divine design, from following the happiest and most loving path that has been laid out by God. This idea brings Curtis to another “can’t”: God can’t go against the divine design. Curtis says that God’s divine design has to be the best plan always. If he worked against that, bad situations would become worse, and he would be going against everything that makes him God. God is always doing the best possible thing to make people as happy as they could possibly be, and he does this through the divine design he created, through the happiest pathway and way to live life. Another animated sequence illustrates this at 1:01:18. In the end, the point of everything in God’s divine design is to create a world in which people are able to work to make others happy, in making others happy, they are fulfilling God’s desire to be one with and create a partnership with humankind. What does Swedenborg think of smudging? Burning sage? Burning herbs, incense, etc.? So is God’s design/order in some way explained in the biblical story of Adam and Eve, the trees in the garden, and the serpent? If hellish spirits can influence our mind, who were the hellish spirits that influenced the first people (as hell had no population at that point)? When Jesus performed miracles did he say his followers could do similar things that didn’t obey natural laws and processes? Why is the Bible written in symbolic language? Why not say it straight out so everyone can clearly understand it? How do people in this world do things which aren’t in accord with their will? But how loving is it for a father to allow so much hell on earth? So often victims have no free will under their perpetrators . . .
What is Swedenborg’s take on the hateful stuff in the Bible? Stoning, misogyny, various hate crimes, etc. Why then does the divine design not stay true to form in all people? Some people are born deformed or are injured. Does Swedenborg ever use trying to imagine a world without being able to choose evil as a way to know it is required to be able to choose good?